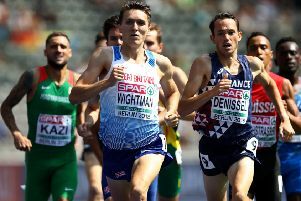 Jake Wightman today admitted he’d feared his bid to shine at the European Athletics Championship would fall apart before he held his nerve to land a superb 1,500 metres bronze. The Capital star, 24, delivered the sprint of his life last night in Berlin’s Olympiastadion to take third place in 3:38.10 as 17-year-old Norwegian Jakob Ingebritsen took gold and Poland’s Marcin Lewandowksi silver. 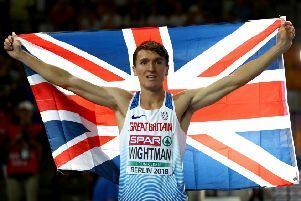 It was another example of the potential which Wightman is now realising following his bronze at April’s Commonwealth Games but he was relieved to escape with a medal to show for his efforts. “That was the most pressure I’ve ever put on myself in any champs I’ve ever been to,” he said. “I had no idea what was going to happen and the way everyone was running up until this point meant that seven or eight of us could have won that. Two years after he led the European final in Amsterdam, only to see his challenge fall apart, this was sweet redemption. “On a lot of occasions, especially the Europeans last time around, I definitely made the wrong moves and compromised my whole race doing so,” Wightman said. Charlie Grice was the second Briton home in fifth but there was huge disappointment for Wightman’s Edinburgh AC club-mate Chris O’Hare after he faded on the home straight, finishing ninth. “It’s annoying.” the two-time European medallist admitted. “I know I could have medalled, and there are seven or eight guys who could have medalled. Lynsey Sharp confessed she will need to regroup and plan for next year’s World Championships after coming sixth in the 800m final – hinting the pressure to land a second European title held her back. “I really, really wanted that and I don’t know maybe I just wanted it a bit too much,” the Capital hope said. “There was a lot of pushing in the first lap and I wasn’t able to find maybe the rhythm I had in the heats and the semi. Lasswade’s Guy Learmonth missed out on the men’s 800m final, coming fifth in his semi in 1:46.83. But Edinburgh AC’s Beth Dobbin will take her shot at glory in tonight’s 200m final after easing through her semi in second place. Eilidh Doyle was eighth in the 400m hurdles final.